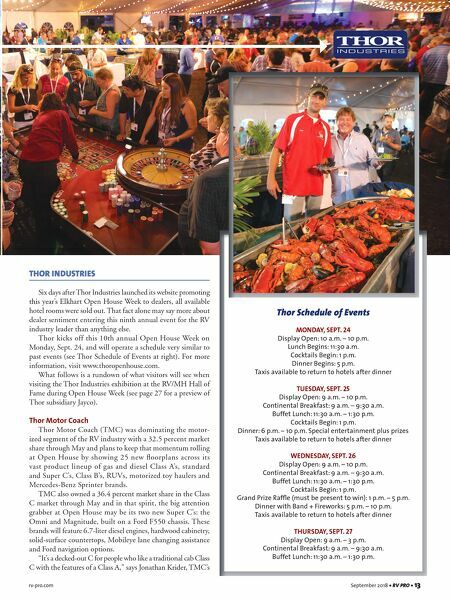 rv-pro.com September 2018 • RV PRO • 13 THOR INDUSTRIES Six days after Thor Industries launched its website promoting this year's Elkhart Open House Week to dealers, all available hotel rooms were sold out. That fact alone may say more about dealer sentiment entering this ninth annual event for the RV industry leader than anything else. Thor kicks off this 10th annual Open House Week on Monday, Sept. 24, and will operate a schedule very similar to past events (see Thor Schedule of Events at right). For more information, visit www.thoropenhouse.com. 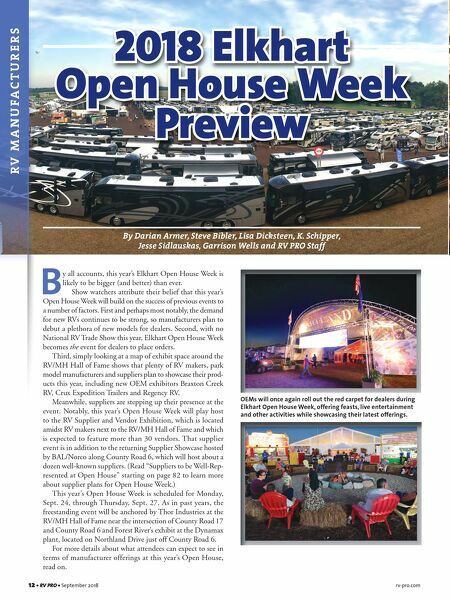 What follows is a rundown of what visitors will see when visiting the Thor Industries exhibition at the RV/MH Hall of Fame during Open House Week (see page 27 for a preview of Thor subsidiary Jayco). Thor Motor Coach Thor Motor Coach (TMC) was dominating the motor- ized segment of the RV industry with a 32.5 percent market share through May and plans to keep that momentum rolling at Open House by showing 25 new floorplans across its vast product lineup of gas and diesel Class A's, standard and Super C's, Class B's, RUVs, motorized toy haulers and Mercedes-Benz Sprinter brands. TMC also owned a 36.4 percent market share in the Class C market through May and in that spirit, the big attention grabber at Open House may be its two new Super C's: the Omni and Magnitude, built on a Ford F550 chassis. These brands will feature 6.7-liter diesel engines, hardwood cabinetry, solid-surface countertops, Mobileye lane changing assistance and Ford navigation options. "It's a decked-out C for people who like a traditional cab Class C with the features of a Class A," says Jonathan Krider, TMC's Thor Schedule of Events MONDAY, SEPT. 24 Display Open: 10 a.m. – 10 p.m. Lunch Begins: 11:30 a.m. Cocktails Begin: 1 p.m. Dinner Begins: 5 p.m. Taxis available to return to hotels after dinner TUESDAY, SEPT. 25 Display Open: 9 a.m. – 10 p.m. Continental Breakfast: 9 a.m. – 9:30 a.m. Buffet Lunch: 11:30 a.m. – 1:30 p.m. Cocktails Begin: 1 p.m. Dinner: 6 p.m. – 10 p.m. Special entertainment plus prizes Taxis available to return to hotels after dinner WEDNESDAY, SEPT. 26 Display Open: 9 a.m. – 10 p.m. Continental Breakfast: 9 a.m. – 9:30 a.m. Buffet Lunch: 11:30 a.m. – 1:30 p.m. Cocktails Begin: 1 p.m. Grand Prize Raffle (must be present to win): 1 p.m. – 5 p.m. Dinner with Band + Fireworks: 5 p.m. – 10 p.m. Taxis available to return to hotels after dinner THURSDAY, SEPT. 27 Display Open: 9 a.m. – 3 p.m. Continental Breakfast: 9 a.m. – 9:30 a.m. Buffet Lunch: 11:30 a.m. – 1:30 p.m.